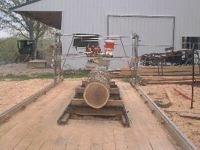 Here are some pictures of my sawmill that I thought you would enjoy. We are really pleased with our amazing machine! 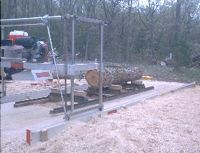 I think it is the ultimate in portable sawmills. I have sawn approx 12,000 board feet of high quality lumber with it since I purchased it, in the latter part of last year. I bought it because I had property with quite a bit of timber of it and I needed a quick and inexpensive way to make it into lumber for my buildings. There were a few problems to work through but once I got it figured out it was pretty simple. Thanks once again for making available such an excellent machine and also for the after sale support. I like doing business with such a company.